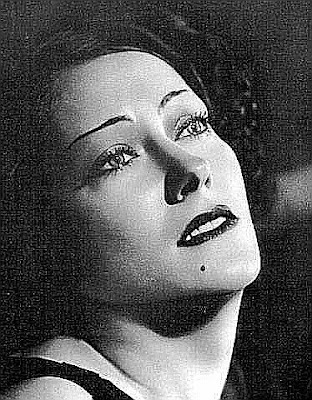 Theodora (Gloria Swanson) is an object of fantasy for two men; one her husband, the other her would-be lover. Her own actions will devastate one of those men; not because she is cruel, but because the truth hurts. Especially when it’s unfair. Theodora is the beautiful third daughter of Capt. Fitzgerald (Alec B. Francis), a poor but hearty retired British soldier, and widower. Her elder sisters, Sarah and Clementine, are as plain as a sodpatch, but pragmatic; they know Theodora’s beauty is the family’s best chance for security. Surely, she can bewitch some nobleman with a fat wallet. This she will do. In her very first scene, Theodora’s rowboat overturns and she is saved by a handsome nobleman in a passing yacht. 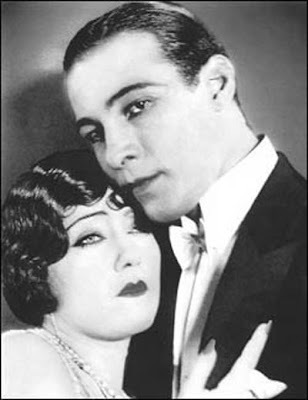 Hector, the tenth Earl of Bracondale (Rudolph Valentino) returns the girl to the beach. She hands him the Narcissus flower she’d pinned to her shirt; she asks him to enjoy the scent, though it might be waterlogged. He will not forget her. He couldn't forget her. Theodora stands out not only because of her beauty, but because of the kind of beauty she possesses. Her face has no innocence; it is a wanton, dangerous face, severely angled; it would’ve swirled the brains of anyone in her little, impoverished village and it belongs only in the presence of a lustful and lazy, wealthy young man. And that name—Theodora, also the name of the lowborn but gorgeous Byzantine actress who married the Emperor Justinian. Hector? He was the prince of Troy, of course; and the Narcissus the symbol of all-consuming, lethal vanity. The couple seem like a pair of gods, fragrant like the flower, surrounded by plain things. But we all need to eat. 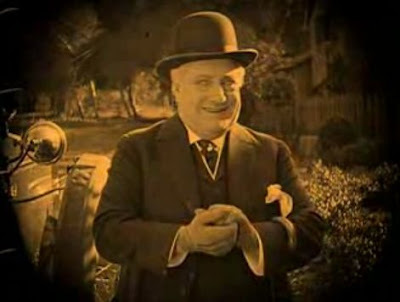 The next intertitle sets the plot in motion: “Eventually Fate brings for Theodora a suitor who meets the family requirements.” And so we're introduced to Josiah Brown (Robert Bolder), a short and portly former grocer, now self-made millionaire. Josiah arrives at the Fitzgerald home immensely satisfied. He earned his money, and with it bought influence, freedom, and a big car. Now he wants a beautiful wife. The family finds him off-putting, but Clementine and Sarah like his money. Theodora stands on the Fitzgerald’s front stoop, flanked by her sisters, and accepts Josiah’s proposal. We expect to dislike Josiah, but it proves difficult. He is not overbearing, despite his position. He’s not miserly, either; following the wedding, he takes his wife on a honeymoon in the Alps, dressing her in beautiful jewels and furs. Josiah’s chief flaw seems to be his lack of energy. Maybe he used it all up in becoming a millionaire. When Theodora asks him to go hiking in the mountains, he declines. His lungs are bad. Or perhaps, he doesn’t feel so comfortable hanging out with the idle rich. Hector is also staying at the inn, and like Theodora, he’s being watched. He’s joined by both his mother and the woman she’d have him marry, Morella Winmarleigh (Gertrude Astor). Neither of these ladies is around later when Hector and a male friend decide to hike in the mountains. Again, his party crosses paths with Theodora’s, and again, she endangers herself; losing her balance and falling over the cliffside, dangling unconscious by a rope. Hector rappels to her aid, and the pair are lowered to a rock ledge, where he revives her. She smiles at him: “Fate seems to send you to me when I most need you, Lord Braccondale.” Theodora must put a lot of stock in forces outside her control. She and Hector are eventually pulled to safety by a rescue party that includes a distraught Josiah. He tends to his wife while an irked Hector stands and observes. Hector will accept Fate, if it works fast enough. But he’s the type to rush. With his unlimited time and money, he follows the couple throughout their honeymoon travels, catching up with them in France. One day, when Josiah is again unwell, Hector and Theodora visit the gardens of Versailles. Here, in this playground of the wealthy, Hector recounts a moronic tale of aristocratic lovers, which the film recreates with Valentino and Swanson playing the roles. The scene is unsubtle, but so is Hector. He lauds the efforts of the bold (that is, adulterous) lover in his story, then declares his love for Theodora. She returns the sentiment immediately, but cautions him: “If we are not stronger than our love, we must not meet again.” Hector nods in agreement, but the scene ends with Theodora’s hand travelling downward to his. Josiah and Theodora end up at a week-long Whitsuntide party, hosted by Hector’s sister in England. Hector is onsite too, with his mother and Morella. Josiah is again apart from Theodora, though this time, at least, he stays in visual range. He strikes up a conversation with Sir Lionel, a British adventurer intent on visiting Egypt and digging for artifacts. Like many people in Beyond the Rocks, Sir Lionel could sure use some of Josiah’s money. Josiah, totally oblivious to Hector’s designs, confides to the younger man that he’s half-tempted to join the expedition, not just fund it. Hector, to his credit, advises Josiah to stay put. The region is reportedly very dangerous. Theodora doesn’t hate this man—she cannot, if we're to maintain any sympathy for her. An intertitle assures us: “After Hector’s departure for London, Theodora decides between love and duty.” She remains at the Whitsuntide party after both her men have left it. She writes two letters, one to Josiah, the other to Hector, and places them both in a box in the foyer, from which servants will take them to the post office. Morella witnesses this, steams the letters open, and switches the envelopes. Dear Josiah. Expect me in London Thursday. I have decided not to wait for your return. Now we dread what must happen. Now we’re in Josiah’s townhouse. He’s sitting down to a genteel breakfast; his butler brings him his mail. He sees the envelope addressed in his wife’s handwriting. He pushes aside the pile of other letters and beams at the thickness of this one. He opens it, and reads a long, grieving letter from his wife to Hector, promising she’ll love the young man always, but regrettably, bidding him farewell. Theodora has written nothing bad about Josiah, but it hardly matters. Josiah is heartbroken. The scene is very, very moving, and Robert Bolder perfectly captures that moment, which we’ve all experienced, when our greatest hope is dashed beyond doubt. Hector now blunders into Josiah’s house, having figured out Morella’s plan. Josiah is livid, but stoic toward his betrayer. “I could kill you—,” Josiah tells him, “—you have stolen my wife!” But of course, Josiah could not kill Hector. He’s too fat, and small, and old, and all his hard-earned money cannot buy youth and beauty—unless, of course, he’s buying Theodora's. Josiah ends this scene with a long, pained look at a photograph of Theodora on his table. She is a venerable object for him. And her photo fixes his attention once again when he looks upon it in a desert tent, in Egypt, some weeks later. He has fled his marriage, and England, choosing to join Sir Lionel on the dangerous expedition. And dangerous it is; the camp is attacked by bandits and a gun battle ensues. It is going on outside Josiah’s tent; he’s only sought shelter to reload his pistol. But upon seeing Theodora’s image, he stops. He turns, walks out of the tent unarmed, and is shot. Josiah lays dying as Hector and Theodora arrive, along with Algerian soldiers, to drive the bandits away. Theodora cradles Josiah’s head against her breast, and the old man is enraptured to the end. He takes her hand, and Hector’s, placing them over his wound. “Do not grieve,” he tells them. “You are young—and I—I want you to be happy.” Josiah’s body is then placed inside his tent, and a weeping Theodora sprawls over it—the very image of a slain great man and his devoted bride. Lying down, Josiah doesn’t look so fat after all. Maybe he resembles the biblical King Josiah, struck down by an arrow in the Holy Land. Even Josiah Brown has the makings of a romantic icon. It is he, not Theodora or Hector, who elevates Beyond the Rocks far past most stories of star-crossed romance. Josiah is the one who reminds us that a beautiful person is desired by many, but may not choose the one most worthy. Usually, beautiful people desire beauty equivalent to their own. At least plain Josiah can become beautiful in defeat. Looks like a great film, mon ami, and I love the still photographs! The one of Josiah is particularly funny - he looks goofy but gruesome all at the same time. But I think you should have more analysis and less summarizing...if I may post a quibble, your review makes me want to see the film, but now I know how it ends...(frowny face). Oh well, it is a pleasure to be exposed to these lesser known screen gems. It's a valid criticism--I wrestle with it myself when I write these essays. Maybe it's my weak will. The endings of some of these films are the best part and what I most want to write about--see the piece on Pandora's Box from a few weeks' back, for example. In other cases, the ending defines the preceding events so completely that it cannot be ignored--as in the Corner in Wheat essay (although that one's a short film, which may be the point).